Hi House Mouse Lovers - Just a quick reminder that we are half way through our current Challenge, hosted by American, who wants you to use a stamp that you haven't used before. a bonus, America is offering two lucky winners a chance to pick two house mouse stamps. was a little intimidated to color it up, but once I got started, I loved it. 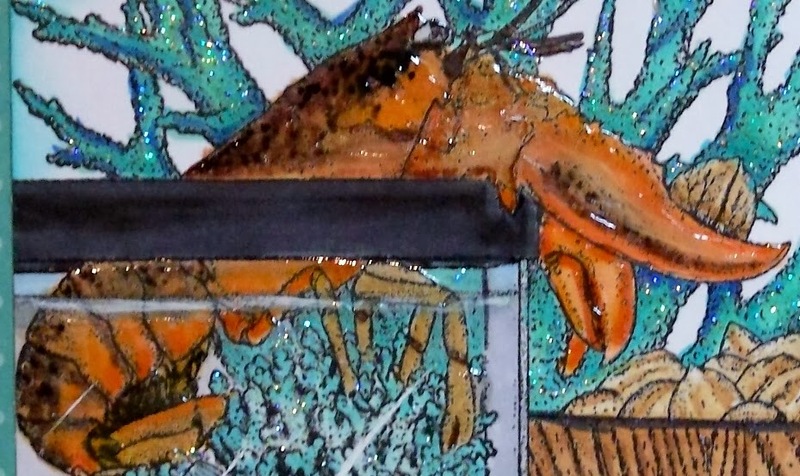 I used glossy accents on the big lobster. Is the little House Mouse so cute with his buddy or what! 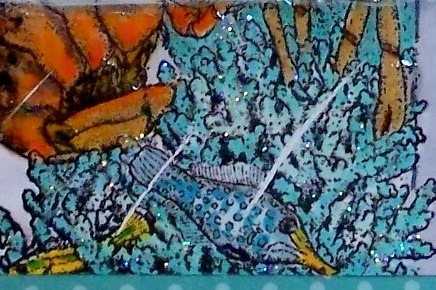 I finished my card off with this little row of fish from a tiny punch. 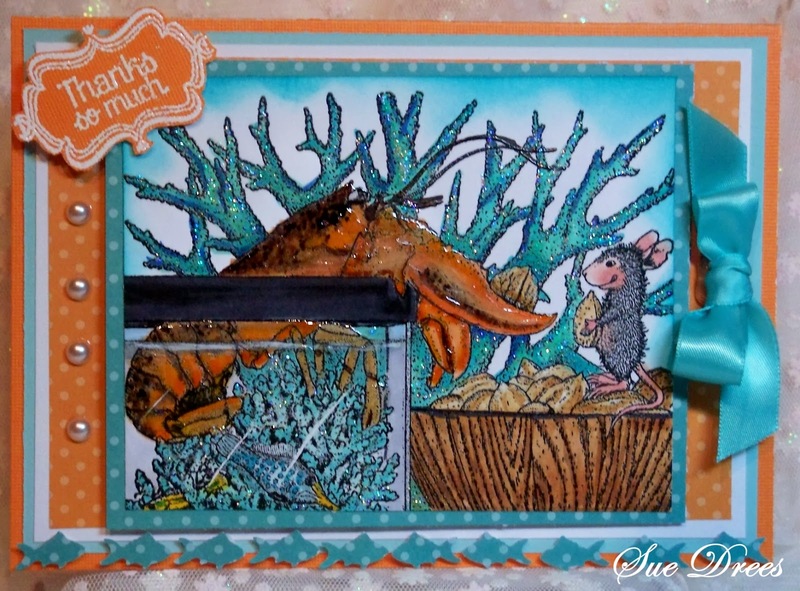 This big beautiful stamp is by Stampabilities and is called Nutty Buddy. Hope you can join the fun and play along with us. You have until Saturday, January 25 at midnight EST. Please take a look at the midweek inspiration on the HMFMC blog. Sue this does look intimidating to color and I think I'd shy away from it, but you did an outstanding job with it. It came out beautiful. Great work with the Stickles also. Have a great week. Oh WOW Sue...your lobster looks like he truly is crawling out of the tank!!! Your colouring and the addition of the glossy accents make him so LIFE LIKE!! And of course you just have to love little mousie!! I am going to try to work on a HM card today...you have rekindled my love for these sweeties!! This is fabulous Sue. I love the fun image, wonderful colouring and the glossy accents look so effective. The added sparkle looks gorgeous too. This is a fabulous card Sue, I love your image with all of the gloss and stickles - gorgeous colours as well. wow fab image and a beautiful card Sue. OMGoodness, that is so adorable, Sue! Love your shiny "yopster". as my kids use to say! LOL! this is fantastic, beautiful colourwork and I like how you do the glossy. great effect. So cute and wonderful! Your coloring is great. Great job on the card! 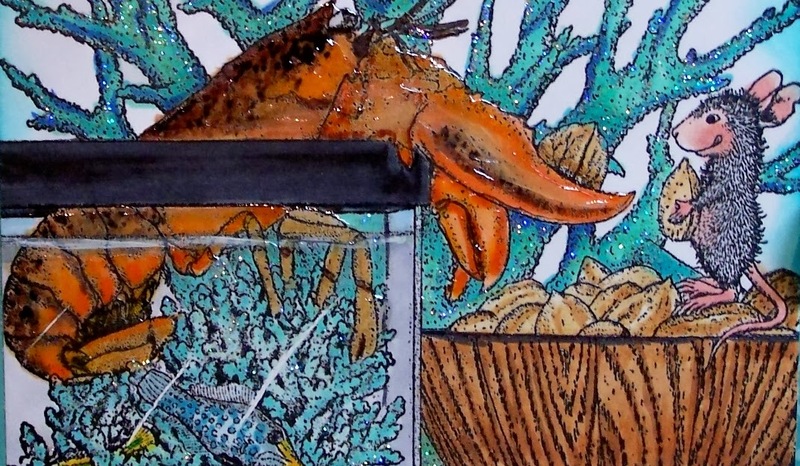 Fabulous colouring, and love the glossy accents on the lobster, looks very life like, wonderful crafting Sue! What a fabulous card Sue. The colors are so rich and your coloring is awesome. Fabulous creation, fun image and a great design.